Half Full! 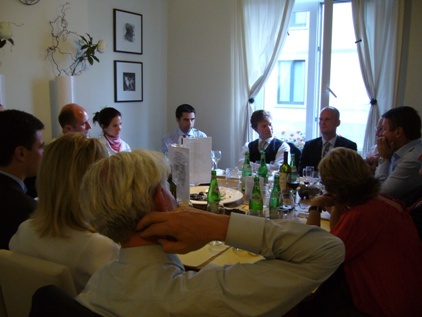 Yesterday, I hosted a dinner with the European Enterprise Institute in Brussels. We had invited people who share the same ideas of the market economy but who might have differing views on the financial crisis and the cure for it. My good friend Johan Norberg started off the discussion. It was a small chambre separée and the discussion turned out to be very intellectually stimulating. But what can you expect with guests like Vitor Gaspar (Barroso Chief Economist), Lars Jonung (EU Commission), Ivan Miklos (former Finance Minister of Slovakia), Henrik Rasmussen (DCI Group) and Gunnar Hökmark (MEP)? There was a lot of worry, not least of the debt-bomb that might explode in very high inflation and thus high interest rates. But in the debate about whether the glass was half empty or half full, most seemed to say the latter.